Welcome to the Graveyards of Omaha. My goal has always been to make The Graveyards of Omaha the definitive site for information and history on Omaha, Bellevue and Council Bluffs people, and on the cemeteries of eastern Nebraska and western Iowa; it will be as comprehensive as possible. My husband Steve and I now live in Bellevue, within walking distance of historic Bellevue Cemetery. Over 95% of Prospect Hill markers are now online at this site. Click the Prospect Hill menu item to the left to see them! The "What's New" page will always have the newest changes listed, and I'm trying to add new links and photos often. If you have questions on genealogy or where relatives might be buried, please visit the Greater Omaha Genealogical Society's website. I don't get into genealogy on my website, and really have no resources for these types of questions. I began this site in 1995, when the Internet was still new, with the idea of posting some individual histories and a few photos of the graveyards and small family cemeteries that I had always been interested in here in Omaha. At the time it was one of the first graveyard sites on the Internet, and I feel that it continues to be one of the most informative graveyard and history websites that is still active. It has been expanded over the years to include every cemetery in the Omaha/Bellevue/Council Bluffs area, and any other cemetery I find, no matter where they are. The greatest concentration will be in eastern Nebraska/western Iowa, since those are closest to my home. I will gladly accept photos from other cemeteries in any locale, family stories, history, biographies and photos of the people whose markers appear on this website; anything that you might have that pertains to a graveyard on this list, or a new one. I’ll see that your name is posted as the contributor. I am also especially interested in hearing anything on Sperling Gardens or Fisher Farm. I would like the information on this site to be correct, but there is always the possibility that information may have changed since I posted it. If you know of any updates or additions to any information on this site please let me know and I'll make the correction. My thanks to Karen at GOGS and Amy in Valley, who have directed me to many out-of-the-way graveyards, to the webmasters of the Sarpy County and Douglas County GenWeb, to Bill Savage for his photo contributions, to Stacey for her photo contributions, and to my husband Steve who has suffered through many trips to cemeteries he never wanted to visit. To navigate the website, use the hyperlinks on this page, in the left-hand column; the links on this main page will open a new browser window for each cemetery. Within each individual cemetery, use the left-hand column buttons to navigate. You can always get back to this main page by using the Home button found on each page. 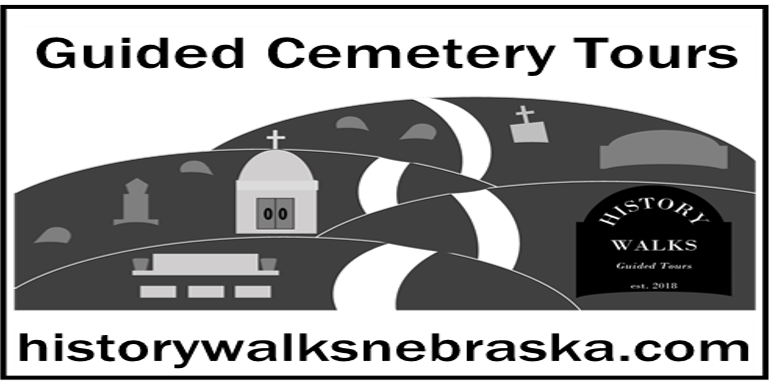 I would also like to thank the Greater Omaha Genealogical Society for some of the background information about the cemeteries on this website. This Cemetery Photo site is owned by Marta Dawes. Want to join the ring? Click here for information! There is a new history tour group in Omaha! History Walks LLC provides guided history tours that are enlightening, accurate and entertaining. Join us as we take a stroll through local cemeteries and admire the artistic splendor of the monuments erected to remember those laid to rest. Learn about their lives and the rich history of the communities they created. To visit their website, click here. Please visit the Hearts United for Animals site at the link above, a local no-kill animal shelter, and donate some dollars to this wonderful organization or adopt one of the animals they have rescued. Our Sweetie Darling, an adorable rat terrier, is a former Hearts United rescuee. We are forever grateful that they took her in as a stray hit by a car, paid to have her broken leg set, and allowed us to adopt her.